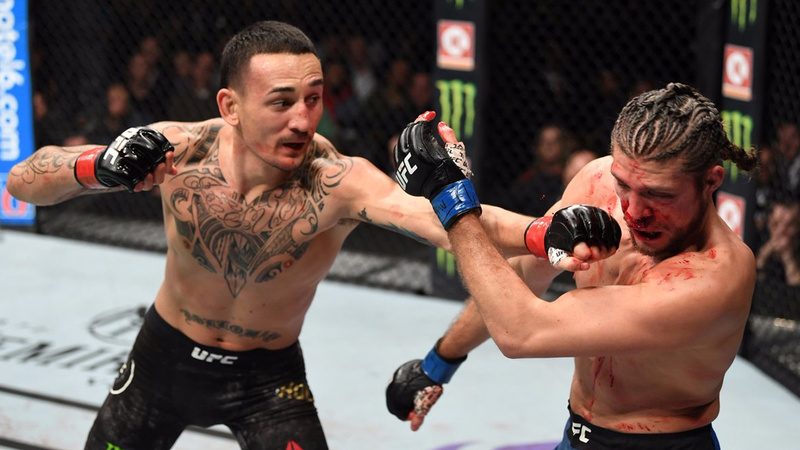 Home MMA News Highlights: Max Holloway Defeats Brian Ortega, Superb Performance! Max Holloway Won Brian Ortega Via TKO (Doctor Stoppage) In One Of The Best Matches Ever! UFC 231 PPV event takes place tonight (Dec 8 2018) from inside Scotiabank Arena in Toronto, Ontario, Canada. The main event of the evening brings the Featherweight title fight between the champion Max “Blessed” Holloway and an undefeated challenger, a former RTC and RFA winner Brian “T-City” Ortega. Brian Ortega in blue gloves, Max Holloway in red. Yves Lavigne is the referee. Here we go! Ortega’s left hand misses its target by a hair. Holloway tries to control the distance, he has the reach advantage. Good right hand from Max Holloway. Jab to the body miss. Holloway with another miss. Ortega blocks right hand like a pro, and Ortega misses weaving overhand left too. Good right hand from Ortega. 1-2 miss Holloway. Good right hand Holloway, he controls the distance. Left hook miss “Blessed”. Great uppercut to the liver from Holloway. Fabulous exchange on both sides. Right left to the face of Ortega, but Ortega returns with a right hand. Ortega lands an excellent right uppercut. Holloway uses left hand all the time to distract his rival. What a shot by Holloway! Takedown Ortega, but Holloway stands up! Right hand Holloway, three right hands in a row! The Hawaiian is killing Ortega at the moment. Right hand Ortega! Holloway changes guard all the time, two right hands, Ortega is rocked! Holloway with a knee to the head, Ortega tries a high kick, then goes for a takedown. He trapped Holloway’s leg and pushes him against the cage. The end of the round, I’d say Holloway won this one. Left jab Holloway. Right low kick Max. Right hand to the face of Ortega lands! How fast Max Holloway is, he landed 3-4 quick shots to the body. Right low kick counter Holloway. Good right hand. Ortega goes for the body but misses. Right hand to the face Holloway, great shot, Ortega looks rocked. He is bleeding! Oh man, how many punches!!! And again a punch to the nose, Ortega’s face is covered in blood! Left cross Ortega! What a left high kick from Holloway, but “T-City” isn’t stunned. Overhand miss Ortega. Again right punch to the face Holloway. Great exchange on both sides! Wow, Ortega misses, right hook counter Holloway! Two big right hands to the face of Ortega, Holloway dominates the match. Ortega misses with a left hook. Left jab Holloway, but Brian has the heart of a lion. Ortega misses over and over, his strikes are simply too short. Right hand to the face Ortega. Jab to the face Holloway. Left cross Brian. It looks like Holloway is cut too. I’d give this round to Holloway. Left overhand miss Ortega. Left body kick Ortega. 1-2 miss from Brian. Holloway ducks like a pro under Brian’s left hook! Wow, what a strike from Ortega!!! Holloway in trouble! Now Ortega tries to take Holloway down but the champion escapes. Wow, a spinning back elbow from Ortega. And now right low kick!!! What a match!!! Low kick Holloway, great right hand too. Good combo Ortega but no damage to Max. Right punch to the face, and a great elbow. Awesome exchange and fighters clinch up. Ortega controls the position but good takedown defense from Holloway. Holloway slips and lands a great right hand. And another combo from the champion!!! Right cross Holloway. Again great counter. Left high kick attempt Ortega. Right uppercut miss Ortega, Holloway punishes the miss with a right hand. Good right hand, it looks like Ortega is rocked but he clinches up. The end of the third round. This one is very tough for scoring! Jab to the face Holloway. Wow, what a punch! Ortega misses with a right hook, Holloway fights from a southpaw stance. Holloway is demolishing Ortega at the moment. Few good punches to the head. Left-hand counter Holloway, the Hawaiian dominates here. Ortega tries to clinch up but Holloway attacks, is this the beginning of the end? Fighters trade shots, but Holloway delivered at least 15 punches to his head!!! Both fighters survived! Wow, another right hand to Holloway’s head. Right hook, left hand, right hook combo. Ortega goes for a takedown but Holloway defends and ends up on the cage. Ortega controlling the position. It looks like both fighters are gassed. Holloway attacks again, man Ortega bleeds so much will someone stop this? Holloway took him down but lets Ortega back to his feet. Ortega’s left eye is completely closed! The Mexican goes for a takedown now. Holloway against the cage but he escapes. What a combo, right-hand drops Ortega! Holloway lets him get up. 1-2 Holloway. Right hand again. Wow, man, 7-8 punches to Ortega’s face, but Brian survives, what a warrior! Holloway won this round. The match is stopped! Max Holloway defends the title! Max Holloway improves his score to 20-3 MMA, 16-3 UFC, Brian Ortega drops to 14-1, 1 NC MMA, 6-1, 1 NC UFC. Ortega lost his first fight. Previous articleHighlights: Valentina Shevchenko Wins Joanna Jedrzejczyk Via Unanimous Decision!